The committee of Stirling Agricultural Show is pleased to announce that prize money for the champion beef cattle, pair and champion sheep will be significantly increased at this year’s show, thanks to main sponsorship funding from Highland Wagyu. The aim of the boosted prize money is to attract even more people to enter the event, which is the last chance for many exhibitors to show their animals ahead of the Royal Highland Show the following week. Held at Blackgrange Field in Stirling by kind permission of the Snowie family, the annual one-day show takes place this year on Saturday 14th June 2014 and welcomes around 2500 visitors. 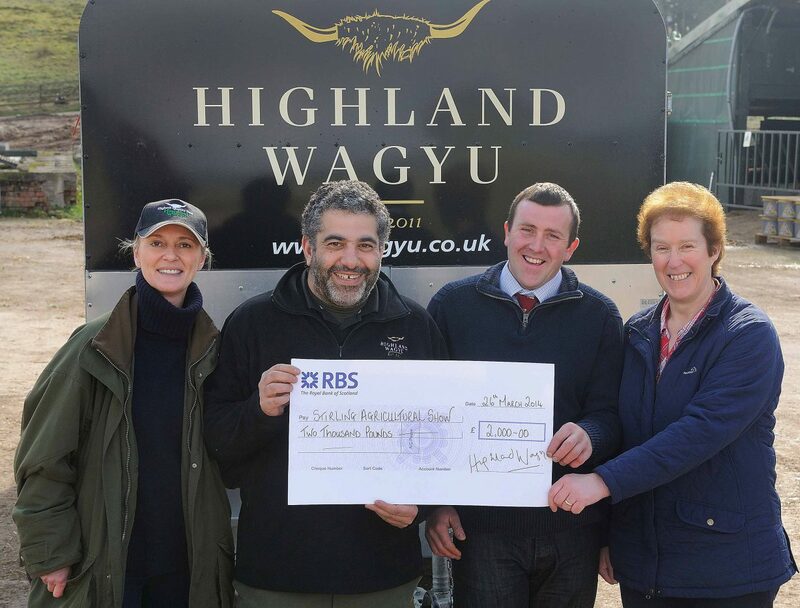 Mohsin Altajir, who owns and runs pedigree beef company Highland Wagyu with his wife Martine Chapman in Dunblane, has provided £2000 sponsorship funding as a main sponsor. The new championship prizes will award £300 to the beef cattle champion of champions and £150 to the reserve; £100 for the overall sheep champion and £50 for the reserve while the champion pair of beef cattle will win £100 with £50 going to the reserve. Stirling Show Chairman John Owen said: “With Highland Wagyu’s support, we’re able to offer a welcome boost in prize money that we hope will encourage more exhibitors to put forward more cattle and sheep in more classes. The funding will also help with the considerable running costs of such a big event. Picture caption: (l-r) Martine Chapman and Mohsin Altajir of Highland Wagyu present their sponsorship funding to Stirling Show Chairman John Owen and Secretary Maureen McCulloch at Blackford Farms in Dunblane. Highland Wagyu is a pedigree beef company, breeding premium Japanese Wagyu, Aberdeen Angus, Beef Shorthorn, Highland and Dexter cattle with a mission to produce the best beef in the world from our 25,000-acre estate farm in Perthshire, Scotland. Established by husband and wife Mohsin Altajir and Martine Chapman in 2011, our ethos of quality, respect and precision underpins everything we do. Highland Wagyu sells directly to chefs. It is the largest producer of Wagyu cattle in the UK and on course to be the biggest in Europe.